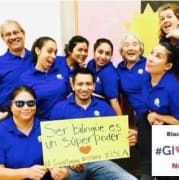 ISLA's Volunteer Program offers opportunities for college students, high school students and community members to practice their Spanish skills. Our volunteers immerse themselves in Hispanic/Latin American language and culture while sharing academic expertise and personal interests with ISLA students and families. Current positions include: Classroom Assistants, Fundraising Committee Member, Photographer, Translator, Social Media Manager, Office Assistant. If you have other ideas about how you would like to volunteer with ISLA, we would love to hear from you! ​ Contact ISLA's Volunteer Coordinator or call (919) 869-7717 for more information. Opportunities are available virtually, in the office and mostly in our Saturday program which is a commitment of four hours at least once a month. Spanish proficiency is needed for the Saturday program but not for all of the other positions.